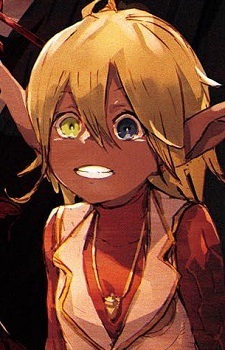 Aura is a dark elf and one of the twin Floor Guardians on the sixth floor in the Great Tomb of Nazarick. She is the twin sister of Mare Bello Fiore and was created by Bukubuku Chagama. Being a beast tamer, she is capable of controlling magic beasts and is a master of guerrilla warfare. In contrast with her brother Mare, Aura is a very cheerful and tomboyish girl who is often quite forward in her remarks. She dominates over her brother, often dragging him around and telling him what to do. At first glance she doesn't appear to get along with Shalltear and often gets into small quarrels with her, but in reality the two of them are quite close as though they were true sisters. She also has a collector's spirit, and since coming to the New World she wishes to add any new creature she finds to her beast collection. Like all NPCs of Nazarick, Aura is completely loyal to Momonga and would sacrifice everything for his sake. She carries out her duties with great zeal and would give up on her own interests if ordered to. She misses her creator dearly, always wanting to hear her voice from Momonga's watch when it was presented as a reward.